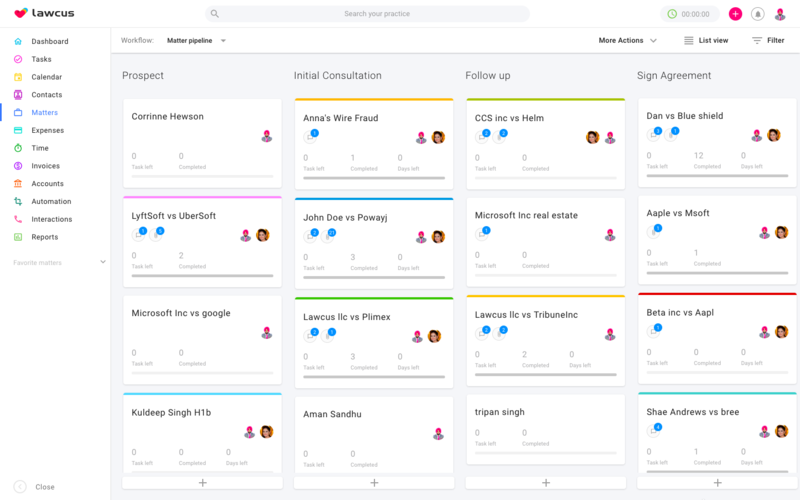 Lawcus gives you a kanban style bird's-eye view to quickly see all your matters and instantly know what needs your attention. And if you prefer lists to boards, you can switch to traditional list view. Legal work is naturally collaborative. 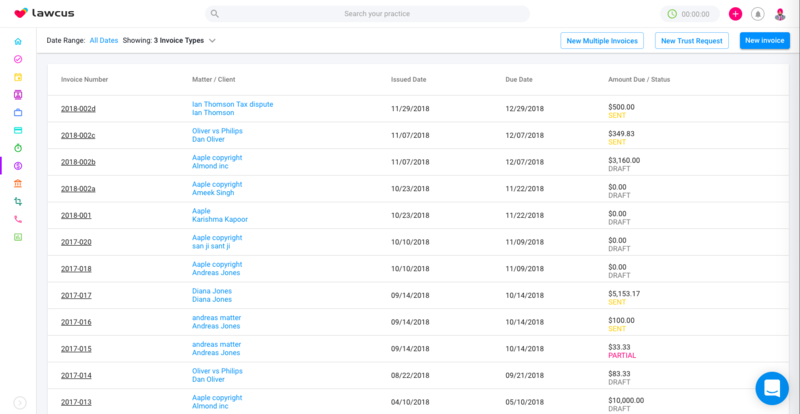 Lawcus puts collaboration, conversation, and automation together to help you deliver more with transparency and less effort. Collaborate with your teammates with matter-centric conversations. Keep all your matter related team communications in one place. Organize and delegate tasks, establish deadlines, keep track of work in progress and get it done faster. No more sticky notes stuck on your computer screen. 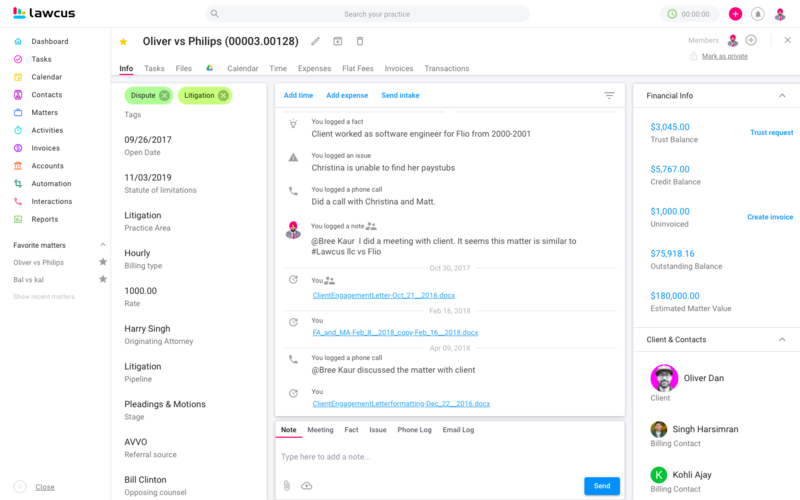 We understand you have a unique workflow, create contact & matter custom fields and groups. Ability to auto-generate matter numbers using a pre-saved numbering scheme. Allows users to create custom numbering scheme. 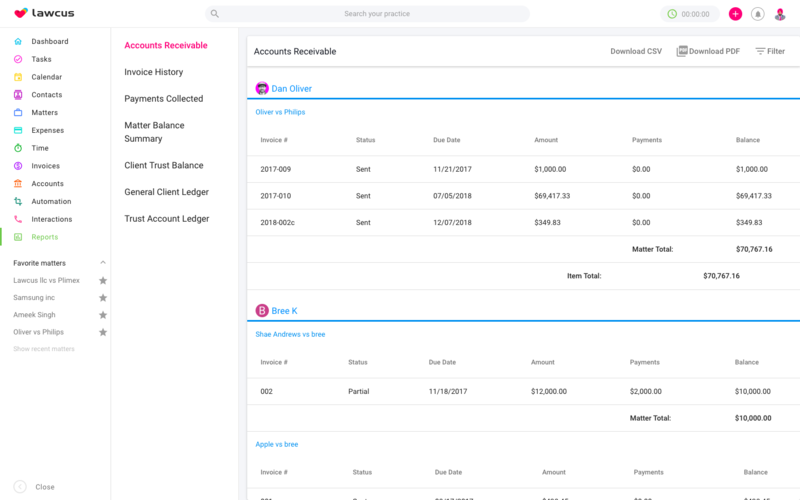 The Summary Report provides an overview of trust balance, outstanding balance, and un-invoiced work in progress on matter and client details. New Folders feature to help you manage client documents with ease. Full-text search allows you to search all text fields including custom fields across Lawcus. Ability to add email and phone logs. You can even record the interactions with the contacts who are not in the system. Localization support for Spanish, French, Italian, Danish, German & Chinese. More, coming soon! 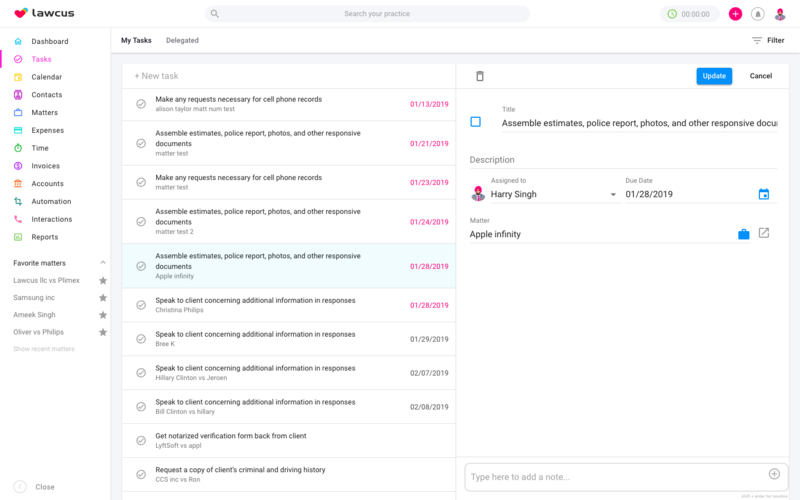 Get notified for any activity like someone assign you a matter or task. You can see all your finances at a glance. You’ll know what’s due, when it’s due, and what’s paid. A simple time tracker & expense tracking built for speed and ease of use. Trust Accounting to help you manage your client’s money with ease and get paid. Ability to make payments, record transactions, transfer funds and mater to matter transfers. Generate multiple invoices for unbilled items in just two clicks. You can do this by clicking on the New Multiple Invoices button, then selecting the matters you would like to bill. Trust Requests allow you to create an invoice instantly to request funds or retainer from your clients in the trust account. The user can select flat rate billing or un-billable option for matters. For flat rate matters system will automatically generate a time entry for the flat fee amount. Ability to set default rates for users and matters. Allows users to switch rates on time entries. Enabling time rounding allows you to configure the rounding increments for time entries. Bill, your clients for unbilled items with just two clicks. You can do this by clicking on the $ icon, then selecting the date range period for bill generation. Are you tired of creating the same tasks every time? Automate your processes with Lawcus. Now you can to automate document management for the different type of contacts. Suppose you added three witnesses on a matter and you would like to create documents for them. Now on document creation from a template, we will give you the option to select the contact you would want to generate the document. Our simple and intuitive form builder allows you to create an online intake form with ease. You can even embed them in your websites — ability to create logic steps and save current progress. Contact tags are labels that help you to categorize your contacts as you like. LawPay allows you to process trust and operating account credit card payments properly. Payment links can be shared with customers so they can pay instantly. 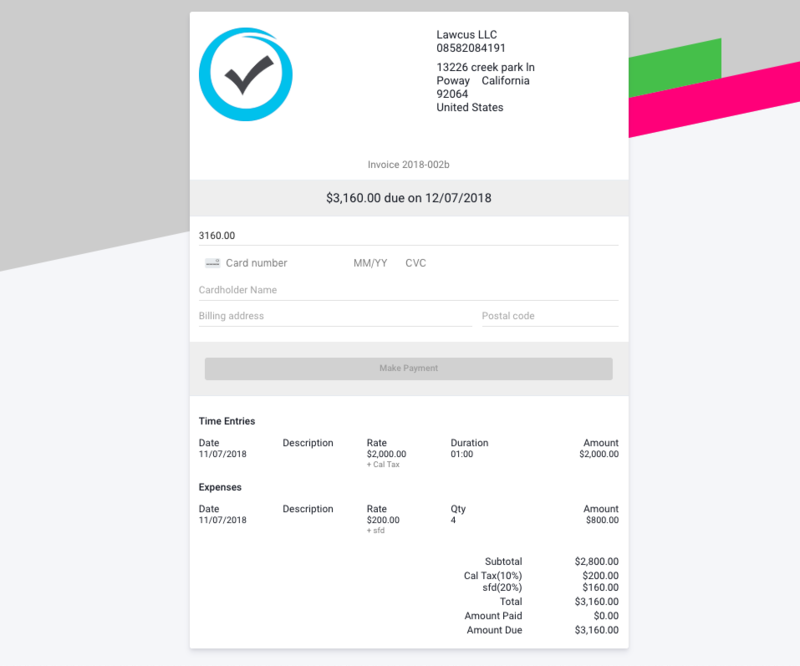 Our Quickbooks integration allows you to sync everything over to QuickBooks Online, like Clients, Invoices and Payments made on your trust account. Note: QuickBooks Integration is a one-way sync. Any activity done in QuickBooks does not sync back to Lawcus. Our tight integration with these cloud storages will allow you to upload files from your computer into Lawcus, and they will be synced to your native cloud storage account. You can create and view files/folders just like you do in their app without leaving Lawcus. For each matter, we will create a folder(Matter Number) in your cloud storage account. Two-way calendar sync with Google, Office 365 and Outlook calendars. The easiest way to associate your emails with matters. Just drag them in matter folders. Syncing your email account with Lawcus allows you to send through Lawcus using your email server. All email sent through Lawcus will appear in your sent folder in your email account just like your regular emails. Lawcus's reporting capabilities allow you to analyze your firm’s performance and identify bottlenecks. Our Advanced Reports Builder let you create custom tabular reports based on parameters and fields that you select. Ability to export your reports in PDF and Excel formats. 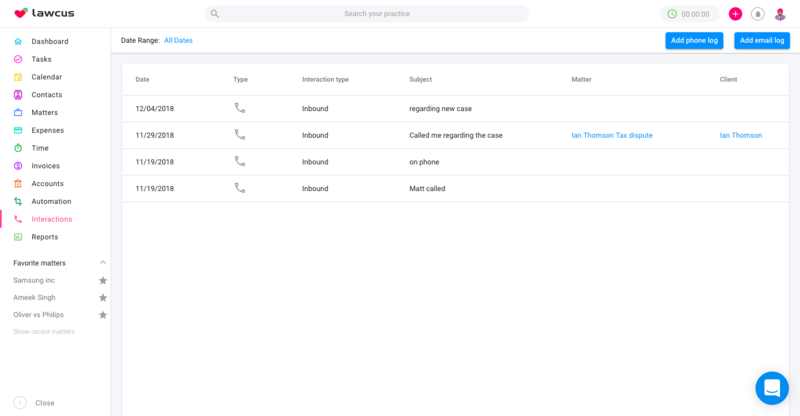 Secure client communication portal allows you to collaborate with your clients, share documents, messages and you can also assign tasks and schedule meetings with them.